i've been so enamored with the photos of liesl and kevin's wedding from martha stewart. liesl menning is martha's executive assistant. her wedding to kevin haynie, the banjo- and guitar-player in josh turner's band, was absolutely eco-chic beautiful. 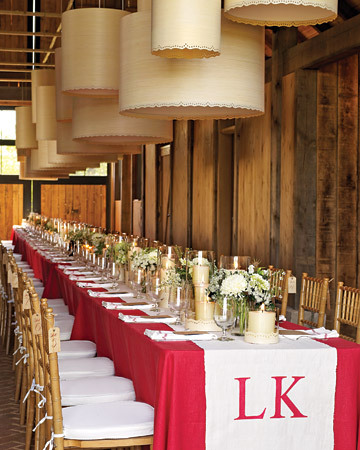 the table setting is completed by monogrammed organic linens, beeswax pillar candles in glass hurricanes, and maple-veneer lamps. see the entire wedding photo album here.